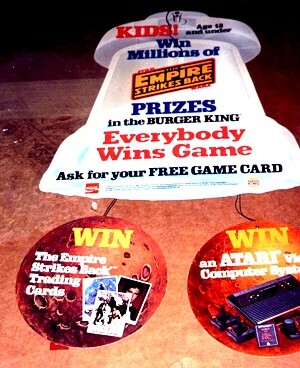 This is the dangler used to promote Burger King's ESB "Everybody Wins" game. As you can see, some of the prizes offered in the game included ESB trading cards and a then state-of-the-art Atari 2600 gaming system. My favorite thing about the display though is the notice in the upper right corner, stating that the game was restricted to those "ages 12 and under." In this day and age, half the people participating in such promotions are over the age of 20.